High school bands are used to playing in basements and garages, but backyards? Maybe not so much. But Lunar Vacation aren’t an average high school band. 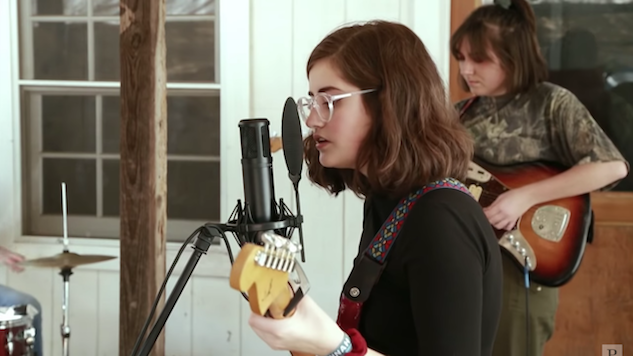 These DIY indie-rock kids (all in college now, actually) play a genre all their own, what they call “Atlanta pool rock,” taking cues from cited influences like Tame Impala, Alvvays, Real Estate and Mac DeMarco and their hometown, Atlanta, Ga. It’s dreamy, synth-y surf-rock that caught the ears of South By Southwest—Lunar Vacation are an official showcasing artist this year. They caught our ears as well, and on Wednesday, Lunar Vacation brought their entire setup to the Paste backyard at the Riverview Bungalow in Austin, what’s most frequently reserved for more stripped-down fare. Our video engineer Brad Wagner said, “This might be the most complex setup that happens here in the backyard.” Lunar Vacation brought a drum kit, synthesizer, two guitars and a bass. Their session is a party, one you’re invited to, as well: watch the entire thing below. Lunar Vacation also landed on our list of the best harpsichord cameos in pop and rock music, which you can read here.